Automotive experts say the next decade will bring a slew of family-friendly innovations with the potential to really rev up your day-to-day driving. Join us in the front seat and enjoy the ride. Picture this: You&apos;re rushing (again) to get everyone where they need to be in the morning. As you approach the car, it instantly recognizes you via a camera in the door or by syncing with the smartphone in your pocket. If your husband or teen drove last night, it will reposition the driver&apos;s seat, change the radio station and deliver hot or cold air according to your personal preferences. The vehicle will cheerfully greet you by name, confirm your destination and suggest the best route based on real-time knowledge of traffic conditions. "Personalization will become an expected feature," says Barb Edson, a general manager of marketing and business development at Microsoft. "Soon cars will be attuned to who, where and how you are at all times." "Would you like to listen to your e-mail?" the car inquires politely as you pull out of the driveway. But the kids are arguing, so you quickly stream the rest of the Netflix movie they were in the middle of watching last night to the backseat. When they've settled down, the car runs through your messages. One item requires an immediate response. You dictate a reply, fire it off and nip a potential crisis in the bud. As you approach the highway entrance, a low fuel warning sounds. Tapping a smartphone-like app on the dashboard summons the best price on gas within 20 miles (or the closest electric charging station). All this convenience is possible because in the next few years nearly every new model in the U.S. will connect to the Internet in some way. Last June Verizon teamed up with major manufacturers like Honda and BMW to create the 4G Venture Forum for Connected Cars, to accelerate the growth of vehicle-based high-speed Internet services. Already the 2013 Audi Connect system allows up to eight devices to surf the Net, download videos or check e-mail at speeds that may be faster than a typical home connection. Ford Sync uses a version of Microsoft Windows Embedded Automotive that offers voice-controlled phone dialing and music playback, up-to-the-minute traffic and weather, and more. 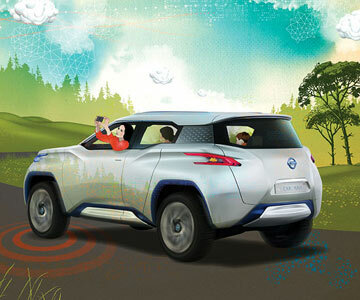 Another key innovation of your Net-enabled car will be embedded sensors that can detect erratic driving and correct it. If you start drifting into the other lane, the steering system will gently guide your car back where it belongs. Continue weaving and the car might rumble the steering wheel or crank the radio to wake you up, or flat-out tell you to stop and rest. Should sensors perceive too much alcohol rather than exhaustion, they might temporarily lock the transmission. In the case of a teenager trying to drive after drinking, the response might be a text alert to Mom or Dad. What sounds like The Jetsons isn't that futuristic. Cars exist today that offer lane-drift correction and drowsiness warnings, such as the 2013 Ford Fusion. Ford is also researching models with seat belt sensors that monitor heart rate for signs of stress. Takata, maker of auto safety equipment, has received a $2.3 million grant from The National Highway Traffic Safety Administration (NHTSA) to develop sensors embedded in the steering wheel that can measure blood alcohol levels via your finger. In fact, a car that can completely take over the driving when you are bored, tired or about to make a dangerous mistake is on the horizon. Built-in vehicle-to-vehicle wireless communications will enable cars to detect various objects within 300 meters. When another vehicle gets too close or trouble is clearly imminent, the auto will issue a warning. If you don't react quickly enough, it will attempt to prevent impact. A few high-end 2013 models like the Audi Allroad offer adaptive cruise control that automatically matches the speed of your car to the one in front of you. If the leader slows while you are on cruise control, so will you, avoiding a potential rear-end collision. The 2013 Lexus LS models will bring a car to a stop if they detects an imminent collision while the vehicle is traveling at up to 24 mph. At higher speeds, they will slow a car down. Cars that instinctively avoid any crash are in view. Last August the U.S. Department of Transportation began a year-long test of vehicle-to-vehicle communications involving nearly 3,000 autos, trucks and buses in Ann Arbor, Michigan. Creating rolling networks of cars could reduce accidents by as much as 70% according to Pim van der Jagt, a managing director for the European Ford Research Center. If the tests in Ann Arbor prove successful, car-to-car communications could be standard within five years, he says. By then, your car will be ready to protect you, and you will be expecting it to do so. Going forward, you may also count on your car to safeguard your kids—particularly teen drivers. Car crashes are the leading cause of teenage death, which is why there are few things harder for parents than handing over the keys to their 16-year-old. But a car wired to short-circuit new-driver mistakes and avoid accidents could alleviate some of the anxiety. In August 2011, Toyota's Collaborative Safety Research Center began a three-year project examining how technology can actively coach teens to become better drivers. (Check it out at toyota.com/csrc/teen-driver-coaching.html.) Within five years of its completion, teen-specific features could debut. Up until now, tech assists have been focused on cars helping human drivers. But in sci-fi movies, the captain can put the spaceship on auto-pilot when she has more pressing matters to deal with. Cruise control may evolve toward this ideal. At first, you'll be able to let the car drive for just a few minutes in predictable situations, such as on straight stretches of highway or in bumper-to-bumper jams. Eventually, this will lead to a vehicle that can pilot itself in situations where driving is no fun, such as stop-and-go traffic, says Pom Malhotra, senior manager for Audi's Connected Vehicle Product Management. Even having the car go solo for a few minutes so that you can take a break will "absolutely happen" within five years, predicts Malhotra. Consider this: Google's self-driving cars have already logged more than 350,000 miles, mostly on California roadways. Once self-driving vehicles are deemed roadworthy for the masses, they will probably become more like personal servants—yours could be dropping the kids at school, then returning for you, or even refueling itself while you work. And no more wasting time searching for parking, because the car can park itself or just go home. While it's not clear when all these wow-factor advances will be the norm, almost all are already technically possible, just not affordable at the consumer level. Right now that's fine. Understandably, humans have trust issues when it comes to letting machines take over. (Think The Matrix or I, Robot.) If the idea of a car that drives itself is totally off-putting, that's just because you haven't had adequate opportunity to accept and adjust. (Remember when FaceTime seemed freaky? Right. Not anymore.) Once you're on board, you can start planning the best road trip ever. Advances in autopilot. We were taught to keep both hands on the wheel at all times, gripping at 10 and 2, but that won't be necessary much longer. 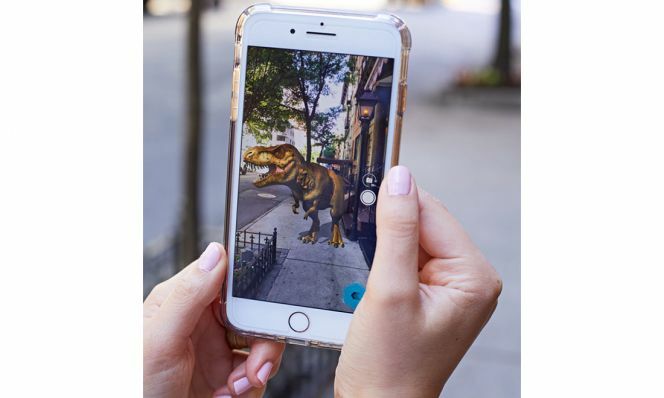 Meet the "You Mobile." Voice, facial or fingerprint recognition will prompt the car to adjust the driver's seat to fit your frame and tune in your favorite radio station. A crash-free car. Using built-in wireless vehicle-to-vehicle communications, new autos will be able to sense objects within 300 meters. Chauffeur at your service. When self-driving cars are deemed roadworthy, you should be able to program one to bring your teen daughter home by curfew. The web superhighway. High-speed Internet connectivity will become as common as cup holders. Streaming entertainment to kids in the backseat will be second nature. Teachable moments. Software will provide focused feedback to teen drivers, helping to build their basic skills over time. Fuel for thought. Gas-powered cars will have plenty of company on the roads, thanks to electric vehicles, gas/electric hybrids and autos powered by propane, natural gas or hydrogen. Dashboard 2.0. Forget about dials and knobs—the dashboard is going to look a lot like an iPad and respond to touch, voice and gestures. If you don't like the standard digital speedometer, rearrange it with a finger swipe. As with your smartphone, you'll be able to download helpful travel apps.